In order for a species to thrive, it must have a safe, sustainable habitat. When species are threatened or endangered, it is usually because of habitat destruction, either due to development or pollution from that development. Lillian Annette Rowe Bird Sanctuary, near Grand Island, Nebraska. A major stopping location for migrating cranes. Photo from Rowe Sanctuary. Endangered whooping cranes spend their summer in Wood Buffalo National Park in the Northwest Territories and the winter on Aransas National Wildlife Refuge on the Texas coast, both protected locations. So, why the worry about the whooping crane numbers diminishing? In my first article on the whoopers’ battle to survive, I wrote about how draught and decreased water flow is affecting the refuge. But other environmental threats are also looming elsewhere. In case you haven’t heard, the United States Department of State is most likely going to approve the construction of the Keystone Pipeline, which will run from Hardisty, Alberta in Canada through some of the most fragile wildlife habitat in the U.S., all the day to the Gulf Coast refineries. 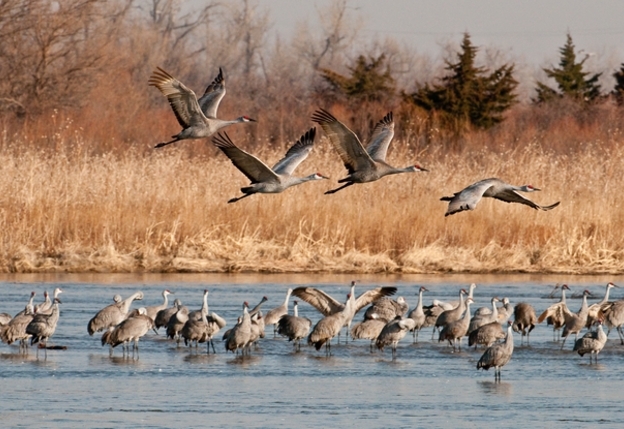 The 1,700-mile pipeline will carry bitumen, which is one of the dirtiest, most corrosive crude oil products, through Nebraska’s Sandhills region, an environmentally sensitive area and one of the last available habitats where whooping cranes, sandhill cranes, and other waterfowl stopover on their annual migration. What problems can this create for the whooping cranes, other wildlife and humans? Spills and underground leaks could contaminate the ecosystem and aquifer that support this habitat. Building the infrastructure to support a 36-inch diameter pipeline would require the bulldozing the enormous green space, destroying more valuable habitat. This type of oil has a heavy carbon footprint and environmentalists believe the product process will lead to increased greenhouse gas emissions. These are merely projections of what might happen. However, whooping cranes living and breeding close to the northern Alberta tar-sand strip minds have already been spotted with black smudges on their white feathers. It’s hasn’t been confirmed, but the tar-sand waste is believed to be the cause. Kathleen Kaska, writer of fiction, nonfiction, travel articles, and stage plays, has just completed her most challenging endeavor. 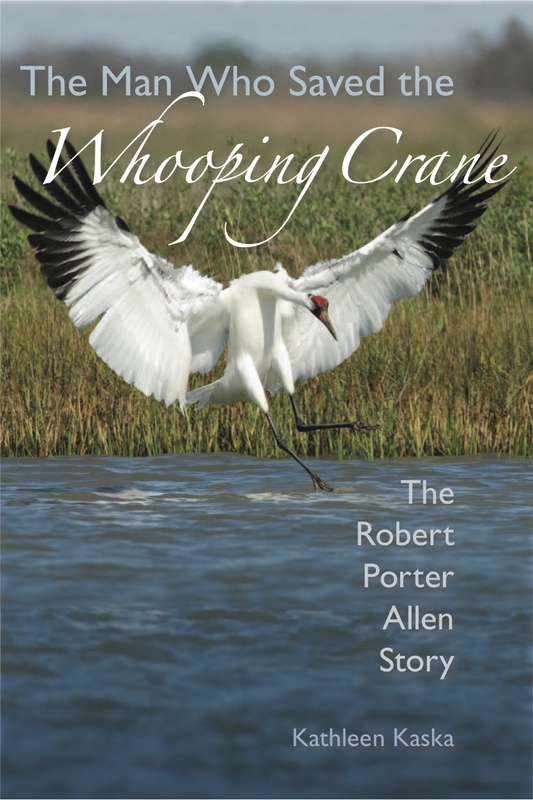 The Man Who Saved the Whooping Crane: The Robert Porter Allen Story, a true story set in the 1940s and 50s, is about Audubon ornithologist Robert Porter Allen whose mission was to journey into the Canadian wilderness to save the last flock of whooping cranes before encroaching development wiped out their nesting site, sending them into extinction. Kathleen also writes the Sydney Lockhart Mystery series and the Classic Triviography Mystery series published by LL-Publications. She also keeps a blog, Kathleen Kaska Writes on Birds and Books.